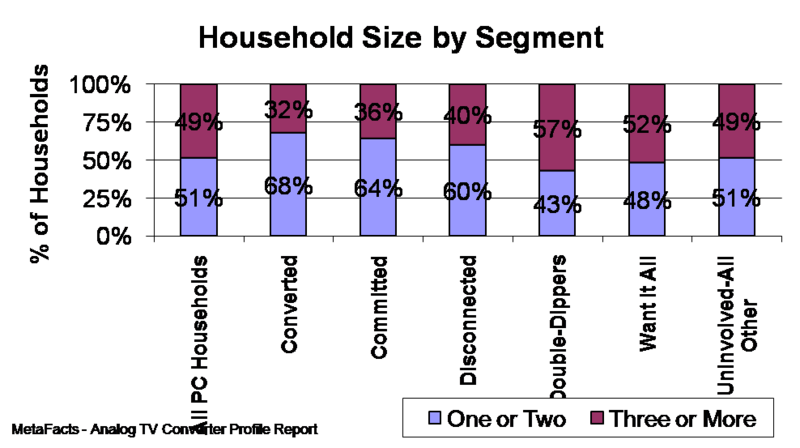 Households that are Converted or Committed are generally smaller than other online households. The Converted – with no Pay TV and already with an Analog TV Converter – have an average household size of 2.3 persons, with 68% having only 1 or 2 persons. The Committed – with no Pay TV and planning to buy an Analog TV Converter – have an average of 2.4 persons, with 64% having only 1 or 2 persons. By comparison, the national average for online households is that 51% have 1 or 2 persons. Double-Dippers are at the other end of the spectrum. These households that have Pay TV and also have an Analog TV Converter have larger households. Well more than half – 57% – have 3 or more household members. How many in each segment have converters? Current Pay TV Customers – the ripest segment? Analog TV Converters – a Boy Toy? Fear, Uncertainty, Doubt and Fun? MetaFacts releases ongoing research on the market shifts and profiles for Windows Vista, Mobile PCs, Workplace PCs, Home PCs, Broadband, Digital Imaging, and many other technology industry topics. These Profile Reports are in a series on specific topics utilizing the Technology User Profile Annual Edition study, which reveals the changing patterns of technology adoption and use in American households and businesses. Interested technology professionals can sign up for complimentary TUPdates, periodic snapshots of technology markets.